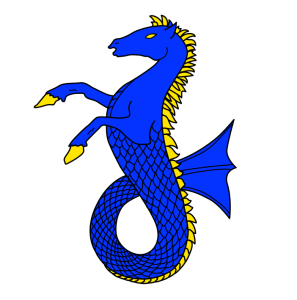 Over the last forty-odd years, Østgarðr has registered several pieces of armory featuring a heraldic sea-horse, and I thought it would be useful to collect them all in one place for easy reference. 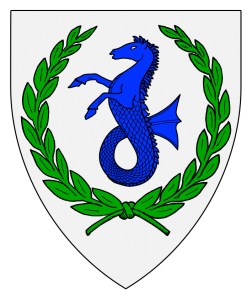 Argent, a sea-horse erect azure within a laurel wreath vert. Note that although recent depictions often show the sea-horse’s front legs terminating in fins, the device that was submitted in 1984 has hooves, as do both of the related designs that follow. Also note the lack of gold accents anywhere on the design; this sea-horse is simply blue, unlike the original 1979 device. A seahorse erect azure, hoofed, orbed and crined Or. It differs from the below in lacking a gold wreath, and in having its eye labeled as golden instead of its tail. This design is sometimes used as a populace badge, although it is not specifically so labeled in the armory. [Update, Dec 2016:] An administrative change has been submitted to the College of Arms to designate this as the province’s populace badge. A sea-horse sejant azure, crined, finned, unguled, and gorged of a laurel wreath Or. It appears to be the earliest piece of armory registered by the branch. Because the original submission was in black and white, it is difficult to determine how much of the tail fin is intended to be gold. This version, with the laurel wreath around the sea-horse’s neck, does not appear to be in active use. 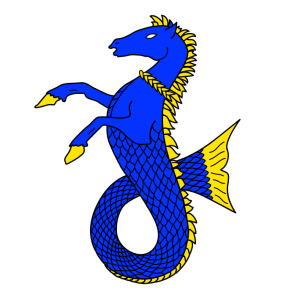 See also the “natural sea-horse” associated with an award in Heraldic Orders and Awards of Østgarðr, and the unregistered devices in Released and Returned Sea-horses of Østgarðr.